A wonderful museum made even better by extensive renovations. Many French cities have a Musée des Beaux Arts, but no other city has a Musée des Beaux Arts like the one in Dijon. Housed in the beautiful Palais des Ducs de Bourgogne (map), the Musée des Beaux Arts is one of the oldest museums in France. In 2013 the Museum reopened after extensive renovations, bringing modern technology, interpretation, and information systems to complement the wonderful collections. The Museum is a delight to visit, and on top of that, it's even free! The initial part of the visit focuses on Burgundy and the history of the Duchy of Burgundy. Highlights include the ornate tombs of Philip the Bold (Duke from 1363-1404) and his son John the Fearless (Duke from 1404-1419) and his wife Margaret of Bavaria. You can admire these up close in the Salle des Gardes and also from the Musicians' Gallery that overlooks it. 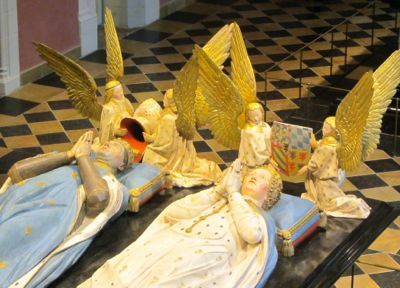 Tomb of John the Fearless and Margaret of Bavaria, guarded by angels. Just across the hall from the tombs are two exquisite gilded altarpieces that date from the 14th century. These Gothic style pieces were carved by Jacques de Baerze and painted by Melchior Broederlam and include intricate detail. It is easy to see how they told the stories of the Bible to the citizens of the 14th century. 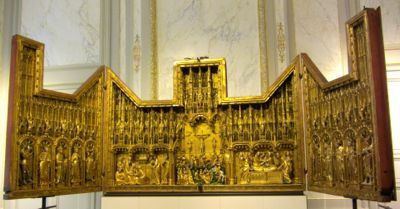 Like many altarpieces of their time, they were made in three sections and designed to be closed; the Crucifixion Altarpiece still has its painted exterior. 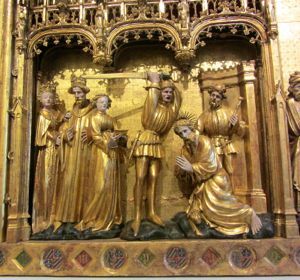 Crucifixion Altarpiece from the 14th century, Dijon. Many other works of art, as well as arms and other objects from the time of the Dukes help illustrate their fascinating history. Exhibits illustrate the Toison d’Or (Golden Fleece), the order of chivalry created by Philippe le Bon in 1430. But the collection is much larger than just the history of the Dukes of Burgundy. It also includes important paintings and sculptures from the Middle Ages to the 20th century. Religious paintings from 15th century France and England lead to secular paintings from Holland and Flanders. Burgundian Art of the 15th century is another area of focus, as is painting from the late 18th century, when the Museum was founded. And just when you think you've seen about everything the Museum has to offer, you'll discover the Egyptian room. This small but high quality collection includes some beautiful pieces, including a series of painted portraits. The Museum is also home to a collection of Contemporary Art, from a donation by art dealer Pierre Granville in the late 1960s. 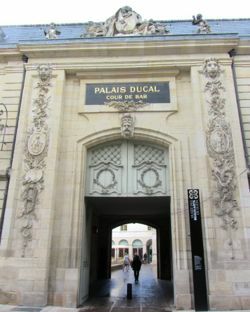 The entrance to the Musée des Beaux Arts is in the Cour de Bar (near the café called the Bar de la Cour). Look for the shiny gold colored panels high on the wall to find the small sign indicating the entrance for individual visitors (groups enter on the opposite side of the Cour de Bar, where there is a much larger sign). The Cour de Bar also holds the Ducal Kitchens, which can be visited as part of the Museum. These huge kitchens date from the early 15th century and were kept busy supporting the elegant lifestyle of the Dukes of Burgundy. The Musée des Beaux Arts is closed on Tuesdays. Admission is free, so if it's too much to take in during one visit, you can come back at your leisure. Above, Detail from the Altarpiece of the Saints and Martyrs. Below, Entrance to the Cour de Bar and the Musée des Beaux Arts. 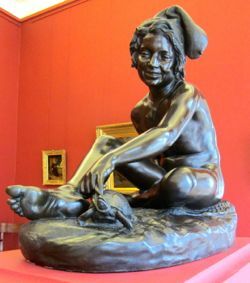 Above, Sculpture of Young Neopolitan Fisherman playing with a turtle, by François Rude, Musée des Beaux Arts.